Take your wireless charging experience to the next level with our Fast Wireless Charger! Do NOT support: OTTERBOX CASE, WALLET PHONE CASE, CREDIT CARD CASE OR ANY OTHER CASES WITH METAL OR MAGNETIC will influence the charging speed or even result in charging intermittently or discontinued. 5V 2A adapter needed for iPhone X, iPhone 8 Plus and iPhone 8. Comes with holder stand design, the qi fast wireless charger allows you can to use your device while charging. Different from AC charging, you can just prop up your phone and enjoy so music and answer calls on fast wireless charger stand without having to interrupt charging. The ElleSye qi fast wireless charger includes a 45 days money back & LIFETIME warranty. 【10W & 5W WIRELESS CHARGING MODES】 10W FAST WIRELESS CHARGING MODE ONLY for Samsung Galaxy S9, S9 Plus, Note 8, S8, S8 Plus, S7, S7 Edge, S6 Edge Plus, Note 5 (9V 2A adapter needed). 5W STANDARD WIRELESS CHARGING MODE works with iPhone X, iPhone 8, iPhone 8 Plus (5V 2A adapter needed) and LG G6, Nexus 4/5/6/7,Nokia Lumia 1520/1020/920/928,MOTO Droid Maxx / Mini / MOTO Turbo 2,HTC Droid DNA, Blackberry Z30, SHARP SH-07D/SH-04D/SH-02D, Sony Xperia Z4v/Z3v and all QI-Enabled Devices. 【INTELLIGENT PROTECTOIN TECHNOLOGY】Exclusive Multifunctional Intelligent Protection Technology provides over-voltage protection, over-heat protection, short-circuit prevention and over-charge protection, which ensure ultimate safety for your smartphone and you. To get better experience, we would like you to take off the phone case and use our recommended adapters (NOT INCLUDED) and cables. 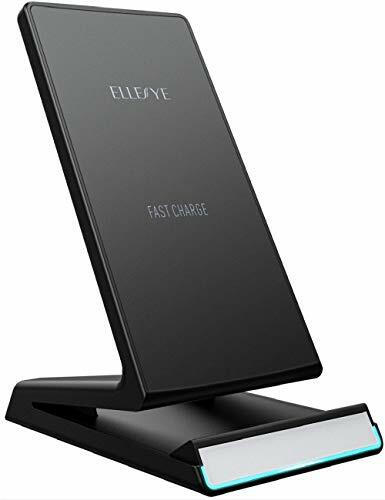 【VERTICALLY & HORIZONTALLY CHARGING】ElleSye fast wireless charger pad supports 2 charging position: VERTICALLY & HORIZONTALLY. For 5.5 inches or bigger screen phones, pls put your phone horizontally for better charging. Designed in 60 degree for you to enjoy a movie or answer a video call without having to unplug while charging your phone, free your hands from holding the phone for a perfect viewing angle.